The "What A Character card kit" is back in stock at the Paper Garden Projects store! Yay! You can go check out Abigail and Feathers MacGee any time. 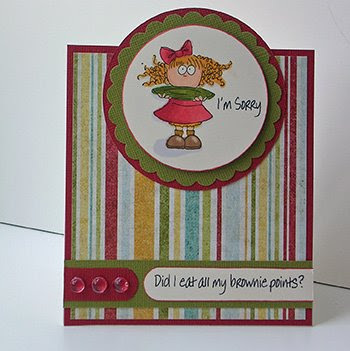 For this card, I used Abigail and the supplies from the kit to make a tent card. With a tent card, the card base is 4 1/4" wide and 9 1/2" tall, folded in half. Then the top piece with the image is adhered to the front so it extends above the top fold of the card. Use the envelope to measure and make sure it will still fit when you are done. The dew drops are included in the kit. I created the rounded strips by cutting a strip of cardstock and inserting only one end into my circle punch. I used the Mega Circle punch to punch my image and the Giga scalloped circle punch to matte it. The even bigger circle was made with a circle cutter. About the saying.... it popped into my head the first time I saw the image and got stuck there. So I just had to make a card with it. I ended up printing the words on the computer, just to get it out of my head! Love the saying! Very cute card! Sorry if this posts twice, got a weird error message the first time I tried! These are soo cute, where can these stamps be purchased? This is so cute! That saying is so perfect! I love this image!